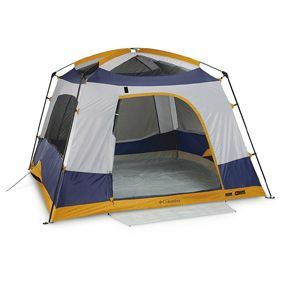 Spacious & affordable, the Columbia Black Mountain tent comes as a 5 or 6 person tent. Learn more about this family tent with our Black Mountain tent review. 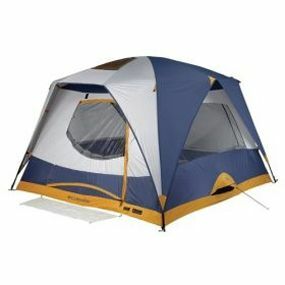 Available for around $100 or less , the Black Mountain tent is far less expensive than many other 5 person tents. Don't let the low price fool you, though. This is one quality shelter. A rugged, dependable car-camping tent, you'll find it provides plenty of room for a full-size family or a bunch of friends -- and even a dog. Before putting your money where our mouth is, though, check out this informative review. While the 5-person Black Mountain tent weighs a few pounds less, it's really not going to mean the difference between health and a broken back. So we'd recommend skipping the 5 person model and just going with the Black Mountain 6. You'll appreciate the extra space, the price is comparable & you're car camping anyway, so the weight doesn't matter. But remember: this isn't a 3 season tent. Camping in early spring or late autumn won't work with this baby. However, it's a great option for fair-weather, summer campers. Floor Size: 120 x 120"
Packed Size: 10 x 27 x 9"
Four big, mesh sides (one of which is a door, too) let in a ton of light and air while keeping out the bugs. Inside the tent you'll find a hanging gear loft, two pocket organizers and two hanging cup holders. Sweet! It even comes with a remote-control light for nighttime visibility and a removable threshold mat. Skylight panels let you stargaze while you drift off to sleep. Did we mention the price? It's really low. On the other hand, it might be a stretch to call it a 6-person tent. Those who've used say it's comfiest with four or five souls. This is yet another reason to buy the 6 person model isntead of the 5 person. Some complain that the tent is heavy, but really, who cares? You're driving to the campsite. Unless you have to hike up an unstable bed of scree, the tent's weight isn't going to be a problem. Although other Columbia tents like the Columbia Bugaboo and Cougar Flats are more popular with families, you'll find the Black Mountain 6 is a great, all-around tent. You already trust the brand, so take our word for it: this tent rocks. Don't plan to stake up at Everest's Base Camp with this bad boy, but the Columbia Black Mountain tent fits the bill for any casual, family camping trip.